Journal of Ophthalmic Prosthetics and the American Society of Ocularists. ABSTRACT: Frank Brady had a long association with the American Society of Ocularists since his book, A Singular View, was first published in 1972. (1) Robert Levy reviewed the book in Todays Ocularist in 1974 and Frank was a guest speaker at the 1984 ASO conference. (2) His presentation and experience with monocular vision was later incorporated into a journal article in 1985. (3) Many ocularists have seen this book pass through their offices. (3) Every patient who leaves the ophthalmologists office with a prognosis of sight loss or enucleation needs this kind of information, whether in this book or through spoken directions. There is only one book on this topic that has reached so many lives. In this article, the author wishes to re-introduce this book to younger ocularists and note the background from which it was written. A Singular View is currently in its 6th edition. Of the estimated 150,000 patients in the United States who lose sight in one eye, only half do so as a result of trauma or eye removal. Every patient who suffers this disorienting malady, however, has the same problem in recovery: how to move about his or her world again. One flight engineer made his own way and has helped thousands in the interim. It was early evening, the sky only lit by the clouds above as the plane was preparing to approach for a landing. Frank B. Brady was sitting in the copilots seat on a flight-research DC-3 over Long Island in April 1948. At 34 years, Frank had already enjoyed a career in designing and testing unique electronic instruments to aid in flight landing. As a matter of fact, he had already been awarded the Medal of Freedom, the nations highest civilian award at the time. The medal had been presented to him for his inventive approach to making aircraft landings safer during World War II. The aircraft flight pattern that night in 1948 was notable for one thing: it intersected with the path of a five-pound mallard duck. This encounter sounds inconsequential on the ground, perhaps, but on an aircraft traveling at more than 250 mph, the duck had a powerful impact. It destroyed the windshield and the right side of Bradys face. Only the aluminum bulkhead behind him kept his neck from snapping. Within minutes of the planes safe landing by the pilot, the dazed Brady was receiving the emergency care that saved his life, but his future had been changed forever in that instant. After getting the news of the loss of his eye several days later, he wondered if his life, too, had been destroyed. Would he be unable to carry on with the things he loved with one eye? He had no way of knowing what to expect. Franks life had always been full, including flying airplanes and playing racket sports. How would he regain his life? After his hospital stay, he looked for anything to help him recover his activities of daily living. He had known several people who had lost an eye, so he tried to remember the things they had told him about their lives. He quickly learned new tricks. Still, there was nothing written on the subject, and the medical professionals around him were either incapable or ineffective in explaining what he could expect. Adaptation was going to be a challenge. Born in Pomeroy, Ohio, in 1914, Frank Brady grew up with a father who was an ordained Methodist minister. His father, Charles Wesley Brady had three brothers who all went into medicine. Although Frank grew up knowing only one of them, Albert, who practiced in Greenup, Kentucky, his other uncles, Frank and Clyde, worked on the medical team on the Panama Canal with Walter Reed. A life of service was an early integral part of Frank Bradys nature. Although the family moved to Columbus for five years, they returned to southern Ohio for Frank to attend high school. He was awarded his Eagle Scout badge in 1931 in Cincinnati. He went on to college in electrical engineering at the University of Cincinnati. Achievements and accolades followed. He worked on instruments to assist flight landings for the U.S. Army Air Force before and during World War II. He also served as a civilian consultant in Europe from January 1944 to May 1945. Following Franks accident, the famed Wendell Hughes, M.D., performed his ophthalmic plastic and reconstructive surgery at New York University. Like much of plastic surgery worldwide, Dr. Hughes seminal techniques were developed during and after the war. (4) Although Frank had a prosthesis made, he always chose to wear a black patch, then considered a dashing feature. He knew how to act with perseverance and to venture boldly into new territory, but at first, even simply pouring a cup of coffee was a challenge. He gradually developed ways of overcoming the loss of depth perception, which he had always taken for granted. The world was no longer arranged in dimensional space in the same way! He proceeded to drive 90 miles to court the woman who became his wife in an eventual 50-year marriage. They had three beautiful children. He even learned to fly again. Brady began to work, write, and edit in his field. Even with only one eye, he was able to perform work that was dependent on his sight. Being able to read instruments was a daily requirement of field work and laboratory research. He was editor of two prestigious professional journals in addition to his work in the field. While Instrument Approach in Landing and Global Navigation kept him busy, he also found time to write All Weather Aircraft Landing, the lead article in the March 1964 Scientific American. (7) He has also been asked to contribute to the legal aspects of monocular vision in cases nationwide. A fellow of both the Institute of Electronic and Electrical Engineers and the Institute of Navigation, Frank was well-known for his writing endeavors. Writing was thus already a companion activity. As he adapted to his new world, he realized that others who were newly monocular had to cope in similar ways. Perhaps their transition could be eased by what he had learned. Notes were gathered, although an early attempt seemed premature. Twenty years of processing a string of cues in order to get around his busy world made Frank wonder again if others could gain from his experience. He asked his neighbor about the prospects and need for a book. Dr. John W. McTigue, chairman of ophthalmology at the Washington Medical Center in Washington, D.C., responded enthusiastically and offered to assist with the anatomical side of the project. He also knew Frank socially from their membership in the 125-year-old Cosmos Club in the city. the cover of A Singular View has evolved into a more contemporary look. A book-publishing proposal can take years, but editor Garrett Oppenheim at Medical Economics Book Division agreed to publish Bradys unique offering in 1970, with the working title Seeing with One Eye. The book idea was reviewed with interest by Curtis D. Benton, an ophthalmologist from Ft. Lauderdale, Florida, although he cautioned of low unit sales because of the limited market. The first hardbound edition of A Singular View appeared in 1972, the first of three editions with this publisher. Other elements contributed to the books usefulness. Franks son, John, then 23, was a gifted artist; he illustrated his fathers notions in descriptive ink drawings. Frank collected anecdotes from eminent individuals and regular patients who were monocular. They included the experiences related by Julius Axelrod, one of this articles authors, who was awarded the Nobel Prize for his brain chemistry research since his own visual loss. The reassuring book includes tips, tricks, and compensations for the newly one-eyed person. Reading the chapters on Getting Back to 3D and Keeping the Good Eye Good have physical and emotional rewards for the newly monocular person. Written in the vibrant way that Frank speaks, the book allows patients to follow the large type and move themselves along their path to a full life again. In 1985, however, the low sales numbers forced the books publisher to let it go out of print. This book was in a very small niche market and an orphan topic. As the book was about to be shelved by its publisher, Frank was invited to speak to the American Society of Ocularists at its national meeting in Atlanta in November 1984. He took a casual poll of the members at that time. ASO attendees indicated that brisk sales would follow. Based on this strong support, he decided to continue publishing this small but useful book himself, whatever the outcome. Figure 2. 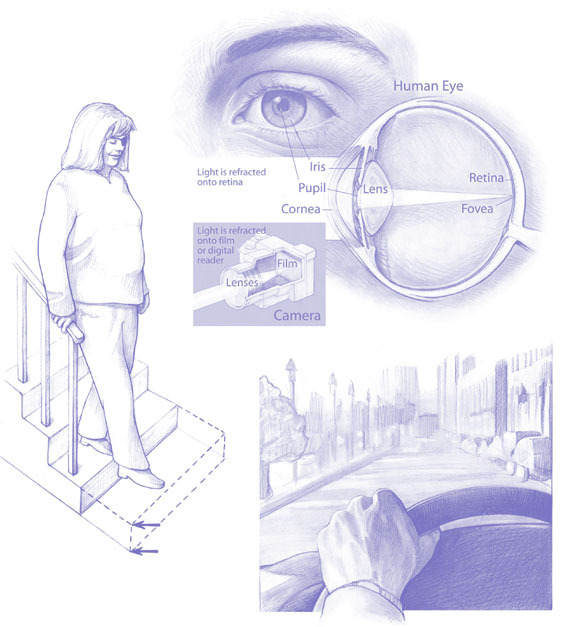 The new interior illustrations reflect the diverse patients of monocular vision. He then negotiated with the publisher to regain the copyright, and proceeded to prepare a new 4th edition, this time in paperback to make costs more reasonable. The financial viability of the project was ensured by the new cottage-industry publishing enterprise and by the positive results of sales. University hospitals, major eye centers, ocularists, and patients, became steady customers. Up until his death at age 88 (in February, 2003), Frank Brady continued in his passions as a ham radio operator and nautical antiques collector. He skippered his 40-foot sailboat on the Chesapeake Bay. He took great pride in personally answering every one of the thousands of letters from his grateful readers. Frank received innumerable letters from physicians, universities, law firms, blind and rehabilitation services, and countless patients and their families, thanking him for providing this service. Of special note is the gratitude of caregivers and families, who, while sighted themselves, are better able to understand the challenges of their loved ones. Franks life is testimony to the recovery possible each year for the steady number of patients who lose one eye. His work will offer comfort to those who ask the same questions and read this little 130-page book. The enthusiastic readership, although small in numbers, has engendered a new edition in the works, including updated concepts and new illustrations. An illustrated version for children (which will also suit illiterate patients) is in the planning stages, as well as foreign translations. A Singular View has now been in print for 30 years. It is based on the event of an accident over 50 years ago. It has helped thousands regain the life they once enjoyed before their one-sided loss of sight. 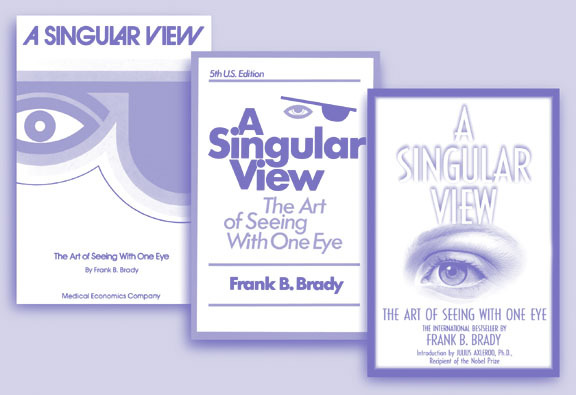 In the last 60 years, there has been only a handful of books published regarding the obscure field of ophthalmic prosthetics There is truly only one reference work for our patients: A Singular View. (9) While Frank Brady did not allow his vision loss to define him, it has continually focused and challenged his ingenuity to this day. Over the span of 20 years, Frank reflected on how he overcame obstacles and then wrote a book to help other patients adjust. Ocularists can sometimes overlook (or ophthalmologists can take for granted) the patients struggle with monocular vision, which is especially troublesome on the temporal side of the loss. So many questions arise. Many times the ocularist is asked to fill in the gaps. After all, ocularistry seems to encompass more than just fabricating prostheses. As Jim Willis so pointedly noted in an editorial message, We want to be more than simple technicians.(10) A Singular View remains an important adjunct to creating well-adjusted, productive, and rehabilitated ocular prosthetic patients. 1. Brady FB. A Singular View: The Art of Seeing with One Eye, Oradell, NJ: Medical Economics Books, First Edition, 1972. 2. Levy OR. From the Bookshelf. book review. Todays Ocularist, vol 3, no 1, 1974-75; 16-17. 3. Brady FB. Monoculars, a neglected minority. Journal of Ophthalmic Prosthetics 1985, 15-17. 4. Hughes WL. Reconstructive Surgery of the Eyelids, The C.V. Mosby Company, 1943. 5. Brady FB. The role of communications in the navigation and control loop. Journal of the Institute of Navigation 1963, vol. 10, no 1. 6. Brady FB. Navigation problems on the north Atlantic. The Airline Pilot, 1961, vol. 30, no. 6. 8. Smith AJ and ODonnell LM. Beyond Arms Reach: Enhancing Distance Vision. Elkins Park, PA: Pennsylvania College of Optometry Press, 2001: 104. 9. Brady FB. A Singular View, The Art of Seeing with One Eye, 307B Maple Avenue West, Vienna, VA 22180, 6th edition, 2004, www.asingularview.com. 10. Willis J. From the senior editor. Journal of Ophthalmic Prosthetics 2002; pp. V.